Hip 580, an American Pharoah colt sells to Zayat Stables for $310,000 to lead Tuesday's session at the Fasig-Tipton October Yearling Sale. The Fasig-Tipton Kentucky Fall Yearlings Sale continued Tuesday with a strong second session, fueled by a steadily rising average and a robust median, both improvements over the first two sessions of 2017. A pair of colts from the first crop of Triple Crown winner American Pharoah rose to the top of the sale's second session. These were led by Hip 580, a $310,000 colt from an exclusive Phipps family which includes Broodmare of the Year and champion Personal Ensign and champion Storm Flag Flying. The chestnut colt was purchased by Zayat Stables, which campaigned American Pharoah, from the consignment of Woods Edge Farm, agent. American Pharoah was also responsible for Hip 383, a half-brother to Grade 1 winner Moreno who sold for $300,000 early in the session. The bay colt was purchased by Alistair Roden Bloodstock from the consignment of Denali Stud, agent. Bred in Kentucky by Pursuit of Success LLC, Hip 383 is from the immediate family of Canadian Horse of the Year Dance Smartly and G1 winner and two-time leading sire Smart Strike. The session's top filly came from the first crop of track record-setting Breeders' Cup Mile victor Liam's Map. The gray or roan filly was purchased by West Bloodstock, agent for Robert and Lawana Low from the consignment of Lane's End, agent. The filly, out of a half-sister to champion Proud Spell was bred in Kentucky by Baumann Stables, Dr. Aaron Sones, and Dr. Crawford. 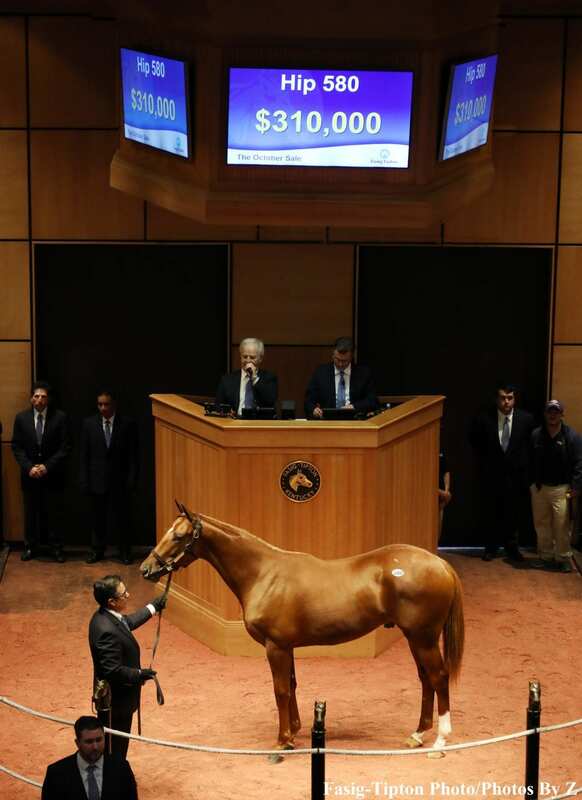 During the session, 256 yearlings sold for $9,068,000, good for an average of $35,422. The median was $15,000, while the session RNA rate fell to 17.9 percent. Compared to the first two sessions of 2017, 479 yearlings sold for $16,585,000, up 11.3 percent from $14,894,500 for 467 yearlings sold. The running average was $34,624, up 8.6 percent from a two-day average of $31,894 last year, while the median rose 36.4 percent from $11,000 last year to $15,000. The collective RNA rate was 22.5 percent, compared to 26.6 percent for the first two sessions last year. The Fasig-Tipton October Sale continues Wednesday at 10 a.m. Eastern. This entry was posted in Bloodstock, NL Article and tagged Alistair Roden Bloodstock, american pharoah, boyd browning, denali stud, fasig-tipton, Fasig-Tipton Kentucky fall yearlings sale, Fasig-Tipton October Sale, Lane's End, liam's map, West Bloodstock Robert and Lawana Low, Woods Edge Farm, zayat stables by Edited Press Release. Bookmark the permalink.